Abby Wambach says she abused alcohol and prescription drugs for years until her arrest for driving under the influence in April. "I was stubborn and I was in denial," soccer's most prolific international goal scorer told The Associated Press in a phone interview. "I didn't want to face the truth." In "Forward," her memoir set for release on Tuesday, the retired U.S. national team star recounts her career, from the lows of losing her high school championship to the highs of winning the Women's World Cup last year. She also chronicles her high-profile marriage to fellow soccer player Sarah Huffman and the struggles they faced. And she tells of her bouts with vodka and pills, which included Vicodin, Ambien and Adderall. Chapters in the book are words that she has been labeled: tomboy, captain, lesbian, and yes, addict. "That night getting arrested was one of the best things that has ever happened to me. Because if I don't get so publicly shamed and publicly humiliated, I don't think I wake up," she said as she prepared for a book tour. "I think I was asleep for a lot of years. Asleep to the pleas from my family and friends, and even myself, to get help. So that night I was humiliated enough to wake up." With 184 goals, Wambach is the leading career scorer - male or female - in international soccer. She retired in December after 15 years with the U.S. women's national team. She says she has been sober since the night she was pulled over in Portland, Oregon, after dinner with friends. It was her rock bottom: Her mugshot was everywhere the next morning. This was not what she imagined her legacy to be. 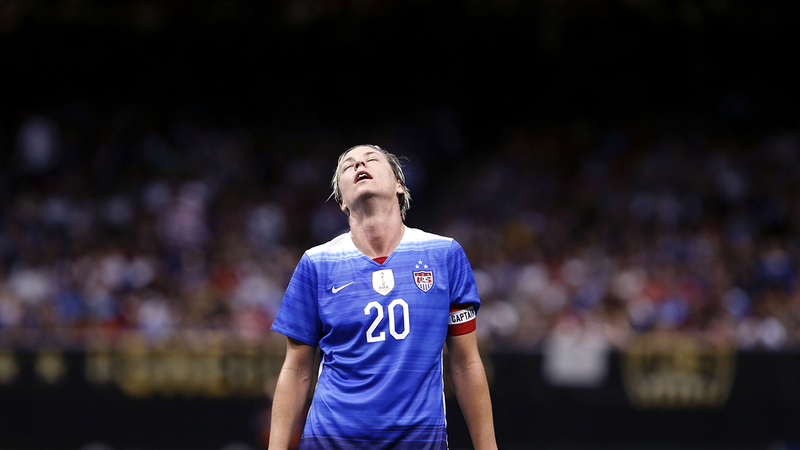 Wambach said that night was a culmination of events as her life spiraled out of control. Her marriage was on the rocks, she was wrestling with her retirement and her direction, and she had just taken a new job with ESPN. She issued a statement on Facebook after she was released from jail the next morning, taking full responsibility for her actions and apologizing to her friends, family and fans. In the aftermath, MINI USA withdrew her from its advertising. She pleaded guilty, agreeing to enter a diversion program for first-time offenders that included treatment. In the book, she never pins down a moment that alcohol and drugs started to become a problem. Like so many who have shared her experience, it developed over time. Those closest to her tried to reach out, including Huffman, fellow national team player Sydney Leroux and friend Kara Mirarchi. "Not only was I hiding this secret from the world for so long, so were the people that I loved - they loved me so fiercely they wanted to protect me as much as possible, almost from myself. Sarah was definitely one of my saving graces because she was one of the first people in my life who made me aware of the problems that I was having," Wambach said. "And this was years ago. This isn't something that just snuck up on me when I retired from soccer. This is something I've been dealing with for years now." Wambach capped her illustrious career with the sport's most prestigious championship when the United States defeated Japan 5-2 in Canada last summer for the Women's World Cup. It was the third World Cup title for the U.S. women and first since 1999. The FIFA World Player of the Year in 2012, Wambach appeared in four World Cups with the national team. She also has a pair of Olympic gold medals from the 2004 Games in Athens and the 2012 Games in London. She did not compete in the Beijing Games because of a broken leg. Wambach announced her retirement last October and played her last match with the team in December, a 1-0 victory tour loss to China in New Orleans. She said she looks back at pictures from that game and her eyes seem hollow. Wambach became more active tackling social and political issues in the later years of her career, and has been outspoken about gender equity in particular. She led a group of players in protesting FIFA's decision to play the 2015 World Cup on artificial turf, which is considered by many to be inferior to grass. In retirement, she has campaigned for Hillary Clinton for president. She also has a weekly podcast and other work for ESPN. But most importantly, she's working on becoming a "whole human being" now that she's not numbing herself. Wambach and Huffman, whose kiss following the World Cup victory became one of the most memorable photos of the tournament, could not work out their differences and are divorcing. In her interview with the AP, Wambach was far less guarded than she'd been in past conversations. After earlier this year proclaiming "I don't get nervous," her emotions were more on the surface as she sincerely admitted her foibles. "It's really hard to talk about things when you're ashamed," she said. "And I'm not ashamed about what happened to me anymore because it led me to where I'm at right now. I'm proud of where I'm at."